~ author of '100 Ways to Overcome Shyness', he is a multi-award-winning psychotherapist, syndicated columnist, author, and former NPR radio host, a keynote speaker and a top blogger for Psychology Today. He was named by Cosmopolitan as one of America's top therapists and honored by several professional associations. 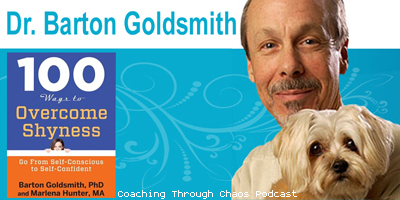 In this podcast, Dr.Barton tells you how to reclaim your life from shyness. Today we are talking about tackling and overcoming shyness. I think most people can relate to being shy in at least certain situations. Some more so and more frequently than others, but I think we can all relate to that feeling of butterflies in our stomach when we think of doing something that instigates our professional or social fear factor. I know for me, as I relate in this episode, I was painfully shy as a child. This did carry over in to my early adult life, but I have tried to push past it over the years, and found tips and tricks like those Dr. Barton will share with us have really helped. He has authored several books, in this episode we are talking about the latest in the new “Overcoming” series- specifically “100 Ways to Overcome Shyness”. This episode is full of practical tips! If you enjoy this episode - please click the like button or better yet, leave us a review on iTunes, Soundcloud or through your preferred podcast listening service.